Canterbury District Watch BCRP has held two conflict management training events for its members this spring. 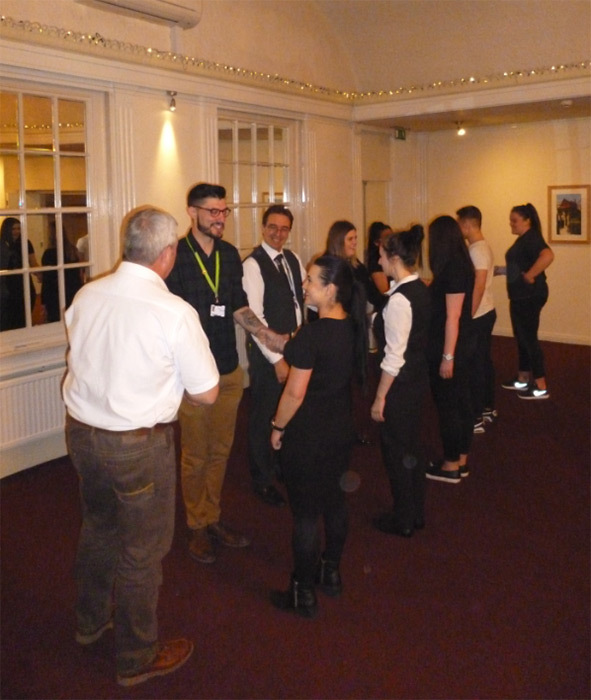 The scheme worked together with Mission Training, part of a local security company and scheme member, to put together one hour presentations in two parts. Firstly, an understanding of issues and triggers of confrontation, then providing techniques for de-escalation. These included verbal and non-verbal encounters, and basic 'break away' skills if grabbed. 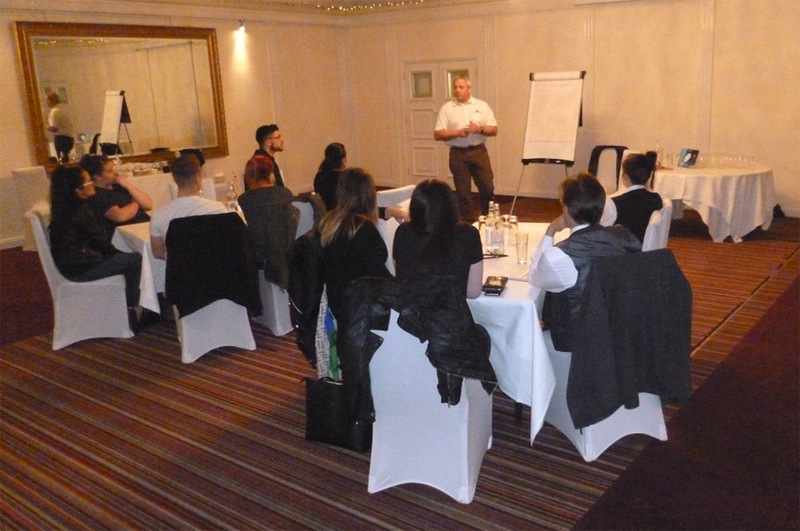 The pre-booked sessions were held at The Abode Hotel in the City Centre over two days including into the early evening. 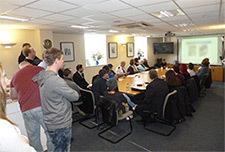 Ninety-three members of staff from a variety of business attended in groups of 8-12. They included retail assistants, bar staff and street pastors. "Efficient and effective techniques delivered in an interactive way"
"It was extremely eye opening and will help me in situations at work"
"The calm manor it was presented mirrored how a situation should be dealt with and how to present yourself"
"Very useful techniques for everyday safety, in and out of work". 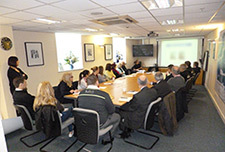 District Watch manager Dave Brenchley said: "Our membership wanted some basic tips in bite sized pieces, so that businesses could release staff to attend. The places went like ‘hot cakes’ & we would hope to put more sessions on in the future as it’s clear there is a demand for this type of training. Attendees ranged from late teens to people in their 70’s and all coped well with practical break away techniques. 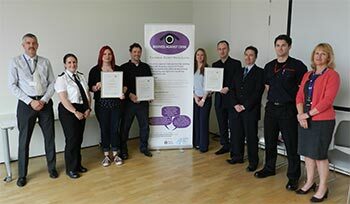 It was fun, but really useful information was delivered to make businesses safer in the Canterbury District." Canterbury District Watch has done it again! Canterbury District Watch has received a distinction level pass from its Safer Business Accreditation assessment for the third time running. The bi yearly assessment is completed by the National Association of Business Crime Partnerships & scrutinises the management of the scheme which operates in the Canterbury Local Authority District. Canterbury District Watch is a ‘not for profit’ organisation & has a membership of over 140 businesses including operators in both the day & night time economies. The businesses, linked by a network of radios can communicate direct to Council CCTV, Police & other members to identify people involved in crime or anti-social behaviour. The membership has contributed to over 40 arrests since September this year. The assessment report praised Canterbury District Watch for its overall service, increased involvement of members & partnership work. Inspector Vicki Tyler from Canterbury Police Station said “Canterbury District Watch remain a trusted and integral partner....and a vital tool in crime prevention and reduction in the Canterbury area”. Doug Rattray, Head of Safer Neighbourhoods at Canterbury City Council said of the scheme” It (Canterbury District Watch) significantly helps to ensure a safe and well functioning night time economy as well as supporting the prevention of crime in our commercial hubs”. 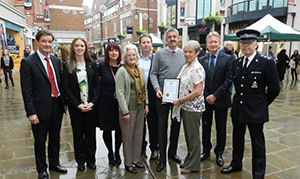 Three city centre businesses have achieved a Safer Socialising Award in recognition of their commitment to providing a safe environment for their customers. The Lady Luck, The Penny Theatre and Club Chemistry were all presented with their award at an event at the Beaney in Canterbury. The Safer Socialising Award is run by the Association of Business Crime Partnerships and aims to encourage businesses in the night time economy to achieve higher standards of management and operation to reduce alcohol-related crime and disorder. It is a national scheme and businesses that apply for the accreditation undergo a thorough assessment of the procedures they have in place to meet the standards. Canterbury District Watch Coordinator, Dave Brenchley, said: “I am very pleased for those businesses receiving the award as the process promotes good practice. They had to demonstrate to partner agency assessors that the management systems, training and commitment is in place to promote safe socialising, and to receive this nationally recognised award is credit to them. "I hope other venues see the value in getting involved as this can only be good news for the city’s night time economy." Detective Inspector at Kent Police, Vicki Tyler, said: "The Safer Socialising Award is a national scheme which requires recipients to undergo a robust assessment process to ensure responsible management of premises and the safety of those visiting them. The award helps to raise standards and reduce crime and disorder, as well as helping visitors to choose venues that provide a good and safe night out in the district." 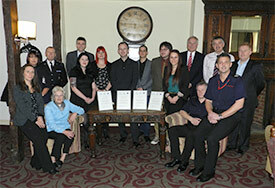 The scheme is supported by the city council, Kent Fire and Rescue Service and Kent County Council Trading Standards. 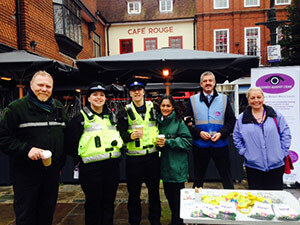 As part of the schemes objective to make Canterbury District a safe place to shop & socialise, Co-ordinator Dave Brenchley joined with partners from Kent County Council, Canterbury City Community Safety Unit & Kent Police for a crime prevention promotion in the city. Purse bells, road safety reflective badges & security advice leaflets were issued free of charge to shoppers & visitors in Canterbury. Dave Brenchley said "the reflective badges were a great draw for parents as they provide a bit more safety during dark evenings when attached to children's coat or bags. The bells attach to purses & let shoppers know if they are grabbed from their handbags. It all helps to reduce crime & keep the District safe"
Good News - Canterbury District Watch receives strong backing from its members. Canterbury District Watch conducted a satisfaction survey of its membership over the spring & summer. Of the 130+ surveys issued, over 40 responded & indicated the scheme is getting things right. The survey asked a number of questions including satisfaction of radio reception, service & support and quality of intelligence briefings. With a highest score of 5 & lowest of 1, the averages were all well over 4, indeed service & support returned nearly 4.5. This customer endorsement comes on the back of last years distinction pass when assessed for the National Safer Business Award. Co-ordinator Dave Brenchley said “We wanted to find out what we were doing well & where we can enhance our service. I’m delighted with the feedback overall, particularly our custom care & intelligence briefing results, which we have worked hard to improve. The survey also enabled us to identify training needs of the members and how we can develop in the future. It is essential the business community works together to reduce crime & disorder in the area, and Canterbury District Watch together with our partners ,help them to do so”. Canterbury District Watch held a successful Counter Terrorism event in late March for both its members & wider business community. 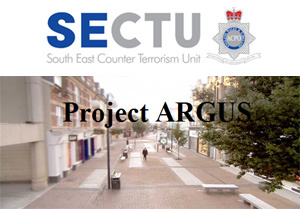 This interactive workshop facilitated by officers from the South East Counter Terrorism Unit involved 'live time' video sequences of a fictional terrorist event in a retail setting. The audience explored options including what to do if it happens, key information to provide to emergency services & importantly how to identify hostile reconnaissance. Attendees took away advice regarding how to be better prepared in their own place of work & staff training tips. District Watch Co-ordinator Dave Brenchley said: "We were able to put this important presentation together with help from our partners from BID connected, Local Authority Emergency Planning & Kent Resilience team. Attendees included representatives of both large & small businesses, education establishments, night time venues and security firms. I am certain that this workshop can save lives & I give credit to those businesses who found the time to attend. Managers & staff have gone away with invaluable information to pass on to colleagues & ensure their own business is more resilient in the event of an attack." Feedback comments included "Brilliantly run....challenging & thought provoking", "Excellent workshop-usual workshops are boring. This workshop was the complete opposite...Well done ...5 stars!" and "An all round good & informative event..thank you!" 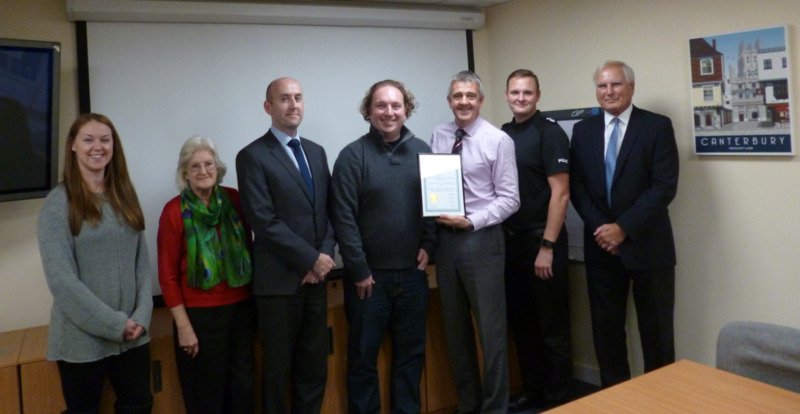 The National & Association of Business Crime Partnerships presented Canterbury District Watch Ltd with a Distinction pass certificate at a ceremony at the Whitefriars Management Suite at the end of October. Partners, Board members attended the event and this National Bi-annual award follows a vigorous assessment as to the management & operation of a Business Crime Partnership. The Canterbury District Watch supports both retail & night time economies by providing intelligence briefings on active criminals & connecting over 120 members to Police & CCTV by a radio network. Assessors were impressed with the schemes close & influential Partnership working, feedback of dynamic & accessible meetings together with a general raised profile of the scheme. 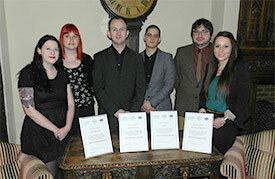 Scheme co-ordinator Dave Brenchley said: "It's really good news for our members & the wider business community. We are a non profit making scheme with the aim of helping Canterbury District to be a safe place to shop & socialise. Our work with the Local Authority, Police & other partners, reduces crime & helps catch those intent on stealing or causing anti-social behaviour. A lot of hard work has gone into setting high standards as a business crime partnership and its nice to see this has been recognised." ded with a joint Police & District Watch briefing regarding active criminals & crime trends. The next meeting will be held on Tuesday 20th May when there will be a presentation from the Bank of England regarding forgery & fraud. Four Canterbury District Watch members have become the first in the district to achieve a Safer Socialising Award. The Lady Luck, The Penny Theatre, Club Chemistry and Chill were all presented with their award at an event at the Abode hotel in Canterbury on Friday 7 February. It is a national scheme promoted by the Association of Business Crime Partnerships and businesses that apply for the accreditation undergo a thorough assessment of the procedures they have in place to meet demanding standards. st Safer Socialising Awards in the district. I would like to thank the four businesses for putting in the effort to be eligible for the scheme and to all our partner agencies that have supported the initiative." Canterbury District Watch has been awarded The Safer Business Award with Distinction (the highest level award) by the Association of Business Crime Partnerships (ABCP) for its work in combatting business crime and anti-social behaviour. Every 2 years the Watch has to undergo a rigorous inspection by ABCP, the approved national body that oversees and monitors the performance of Business Crime Reduction Partnerships (Watch schemes), in order to gain national accreditation. The inspection touches on all aspects of our work, the services provided to members and the relationship between the Watch partners. It also examines whether we apply the national standards laid down by The Association of Chief Police Officers and the Home Office, and data protection protocols. Following the inspection in September 2012, the inspecting assessor stated, "Canterbury District Watch is one of the best run partnerships in the area and I have no hesitation in recommending a pass with distinction." Canterbury has been awarded a coveted Purple Flag for its ongoing work to make the city a pleasant and safe environment in which to meet and socialise. Canterbury District Watch plays its part in that by assisting its partners and members in the prevention and reduction of anti-social behaviour. As an active partner of the Canterbury Community Safety Partnership, Canterbury District Watch, works closely with Kent Police and Canterbury City Council. Representatives from all three organisations have signed an information sharing protocol, to help provide a safe and non-threatening environment by reducing crime and disorder in the district. A fundamental aspect of joint working between the orgnisations is the sharing of relevant information and intelligence that is mutually beneficial and adds value to the work being undertaken, and this protocol sets out a number of principles and the arrangements which will allow this to happen. Included among it's aims, the protocol sets out to formally assert that the three parties will act as a partnership to tackle business crime and anti-social behaviour, and to improve public safety; to establish clear communication channels; and to set the expectations and parameters with respect to the sharing of information and intelligence. For more information about this, and the work of Canterbury District Watch, please get in touch. We have moved our operational base. The registered office address remains the same. See the 'Contact' page for full details.